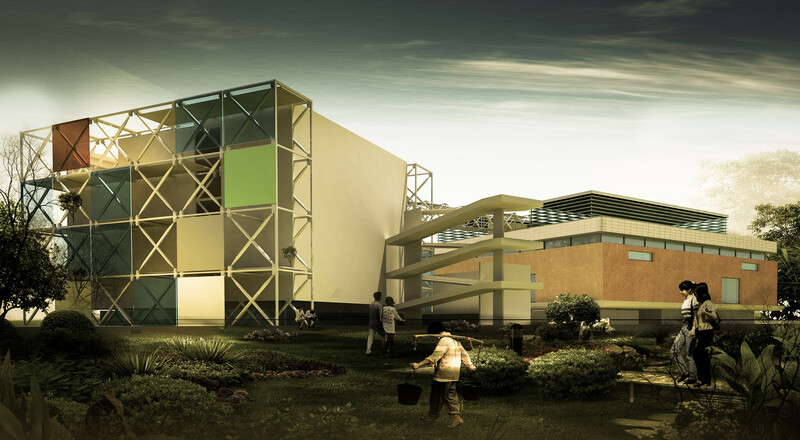 B.Arch Thesis: Revitilization of Le Corbusier's Legacy: Sanskar Kendra, by Rahul Jadon, Faculty of Architecture, Dr. APJ AKTU, Lucknow - ArchitectureLive! Often, we ignore the legacy we have in our hands, failing to recognize the inspiration around us or how valuable that is. Very few cities are as lucky as Ahmedabad, a city with pragmatism and a very progressive outlook. It has created a receptive environment for contemporary developments. Efforts of visionaries have given the city the best of international architecture in the post-independence era- Le Corbusier, Louis I. Kahn and Frank Lloyd Wright. Architects apart, these men were great theoreticians and visionaries, who went on to be an inspiration to a plethora of young design professionals. The first building by Le Corbusier in Ahmedabad was Sanskar Kendra – a cultural center and exhibition place (1954 AD). The exposed brick and concrete edifice with peripheral exhibition space raised ‘pilotis’ realizes his theory of extendable spaces for museums. 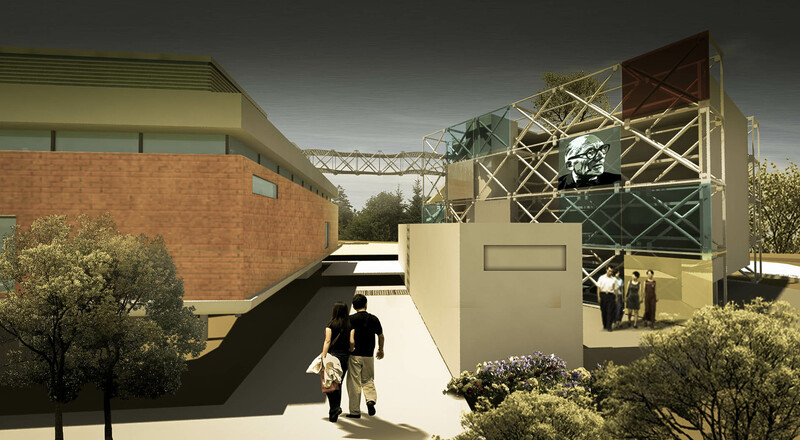 Museum of the city, Sanskar Kendra was a part of an extensive cultural and education project that Le Corbusier repeatedly envisioned and never built. The program included museums of history anthropology, archaeology and ethnography along with exhibition area, restaurants and an open air theatre. Out of whole planned cultural center, only museum was built. The onus of continuing the Corbusier’s legacy fell upon Doshi, who rose to the occasion and designed the acclaimed Tagore Hall in the museum complex. Sanskar Kendra is currently in utmost state of despair due to neglect of maintenance and abuse. Inadequate design combined with poor maintenance put paid to the creepers; the earth has been removed and the deteriorated areas patched up. The box has become silent as a cargo ware house in absence of a sufficient number of exhibitions. Apart from a very few visitors, the place is deserted and dead all the time. The upper floor of the museum is partially used for elections and storage area for election commission. It is an attempt to complete and complement, to comprehend, reinterpret and reinstate. 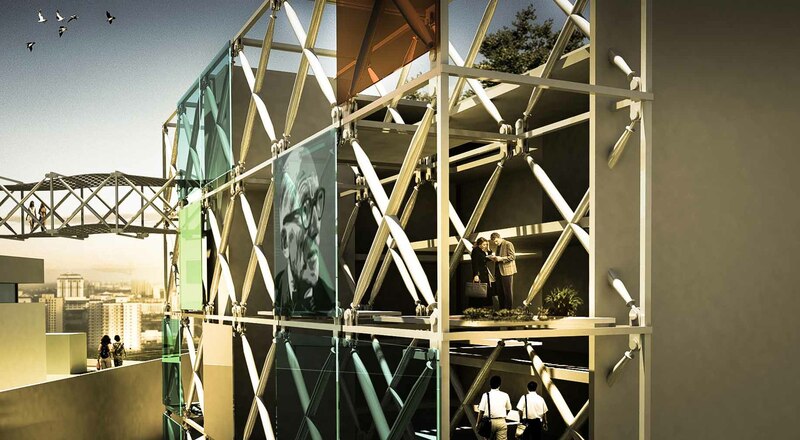 The basic driving conceptual strategy was to reinterpret of the concept of the Museum of Unlimited Growth as conceived by Le Corbusier. He had envisaged a continuously horizontally growing spiral contained within a grid and a box which would be able to cater to the growing collection of any volume. 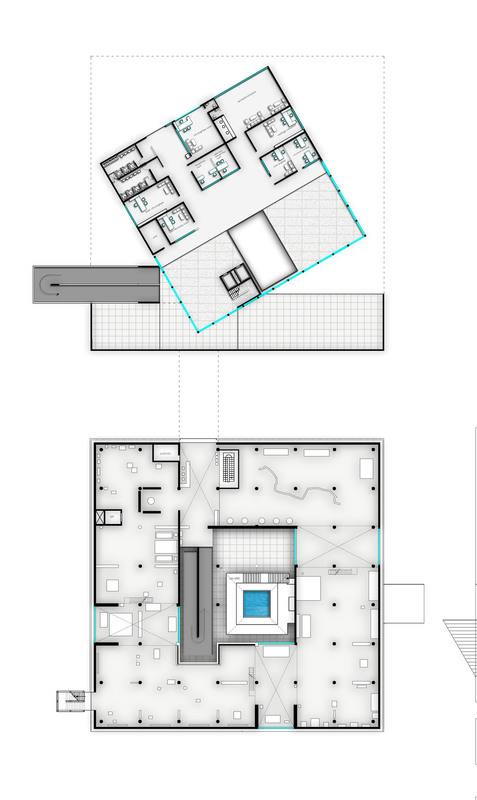 The setting of the site and the context inherent therein were also to be incorporated. Here, context goes beyond the built and the unbuilt. It veers and ventures towards society, economy, philosophy and culture. The Intent in this project is to keep alive the saga of constant up gradation and experimentation. The search for contextual relevance and adaptation over changing times is the preoccupation of this particular research and design work. The author believes that it is an obligation on our part to reflect upon the legacy that we have received, to remold it and further reapply it contextually. The objective is also to take functional retention to a new level and improve upon it. The process includes complete revitalization of campus and heritage structure to project it as a potential urban space and infotainment area. For a successful endeavor, the intervention should be Physically Executable, Socially Acceptable, Economical Viable, Culturally responsible, Ecological livable, and architecturally recommendable. Efforts have been made to imbibe these qualities in the proposal. 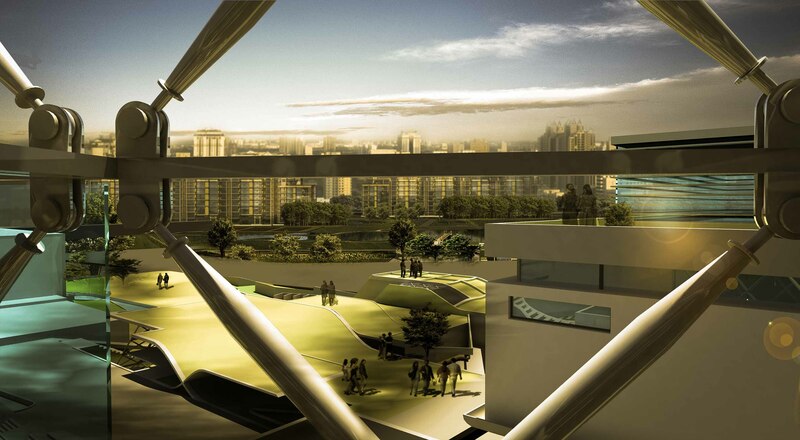 The project emphasizes reliving the same old legacy, but, in accordance to the existing urban, functional, socio-economic context, current scenario of the city and the surroundings of the site. For the reinterpretation studies, research of analytical framework of verdicts from the beginning of the project and then the analysis of those ideas on contemporary and contextual grounds was conducted. 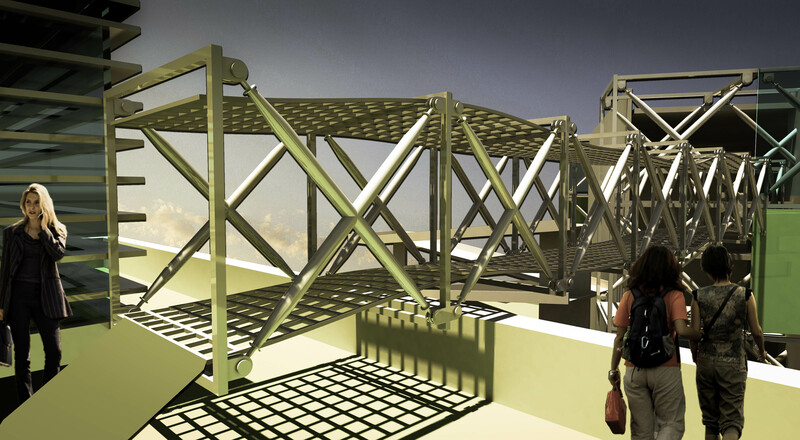 The analysis suggested the appropriate retentions and also the reinterpretations of earlier concepts of le Corbusier. Program is formulated in a way to accumulate and facilitate every section of inhabitants and visitors of city. 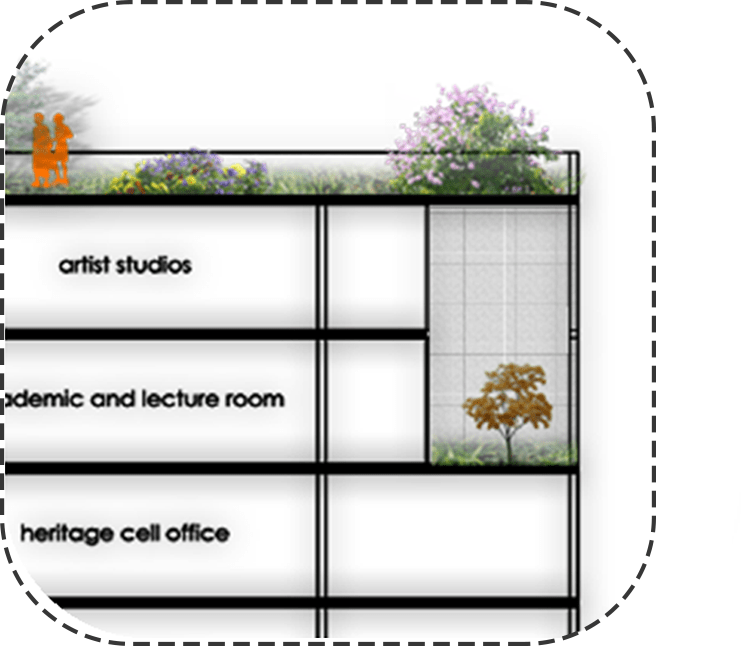 The existing office of heritage cell and AMC are retained in the campus to easy access to proposed facilities and better monitoring. Digital library, media, internet zone, education and training areas are included to educate the youth about the city and culture. It is the only museum which has such versatile collection of city’s heritage. It has the potential to serve as a platform of cultural up gradation and exposure to artists. It can also be projected as a notion of involvement for those communities in synchronization with modern trends of development and demand. Archive section and art lab are for establishing a facility for digitalizing the historical data a national level. Retaining dominance of the edifice is achieved by placing office block behind the museum. 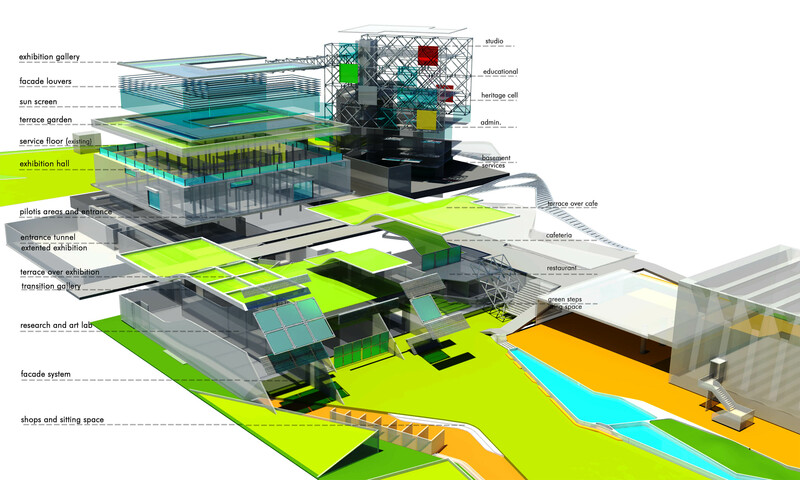 Office building is placed in an enclosure defined by a raised platform. A concrete wall is placed parallel to visual axis created by facade of Sanskar Kendra. The whole complex has been oriented towards the river Sabarmati. The insertions in front and the right of the museum are subterranean so as not to confront with the existing. 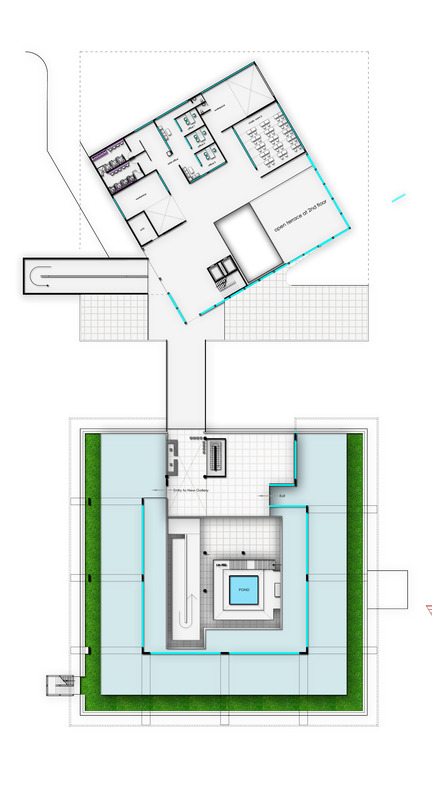 It goes in lieu with Le Corbusier’s philosophy of dominance of the built over the site – Central and Dominating. The geometry has been retained as puritans which reflect on both the additions on the main building as well as the insertions. Idea of unlimited expansion was being manifested as horizontal expansion theory in 1950’s. In the context of soaring land prices and speculation, the theory is interpreted as that of vertical expansion. Scarcity of vacant land in the densely populated Paldi area have required the expansion to go vertical. 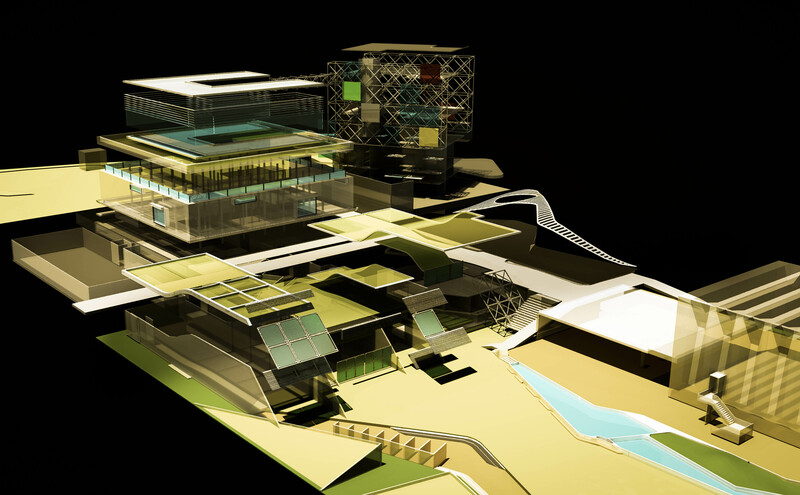 The design attempts to save upon land to minimize the ground coverage and maximize the open green space. 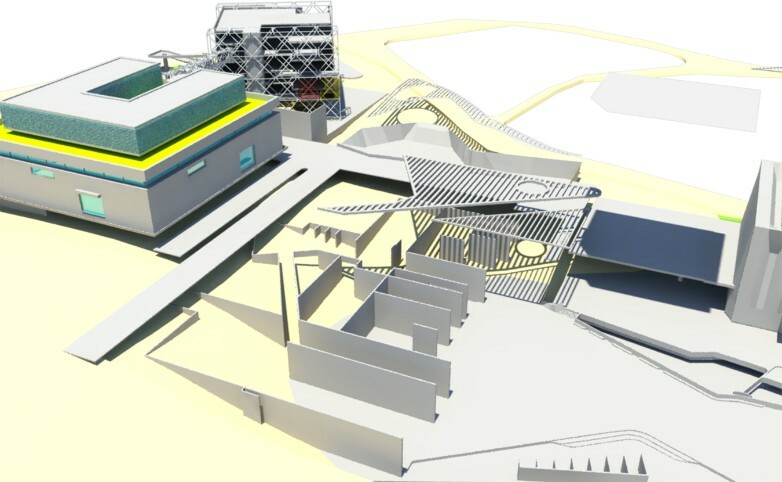 The entry to the new galleries are placed below the ground to reinstate the central court functionality and creating another mysterious level to explore. 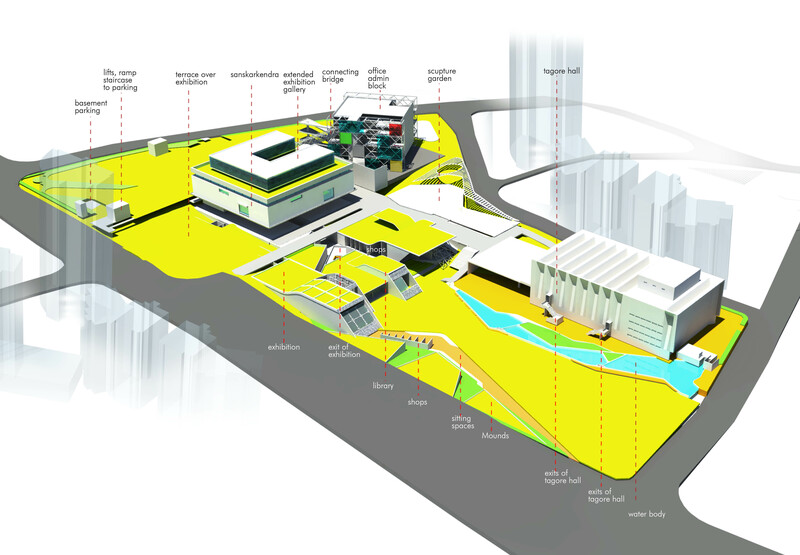 While walking towards the east, the exhibition space below ground will lead the user to another permanent gallery with semi covered areas followed by the art lab and archive section. 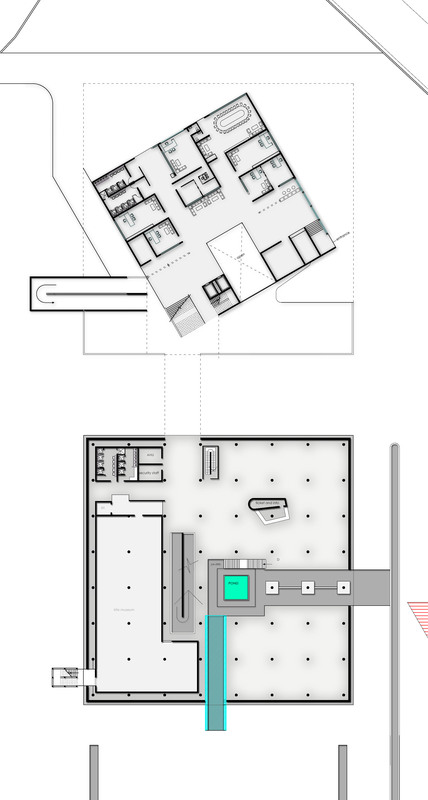 Library is linearly placed facing the open space and can be accessed from both sides. 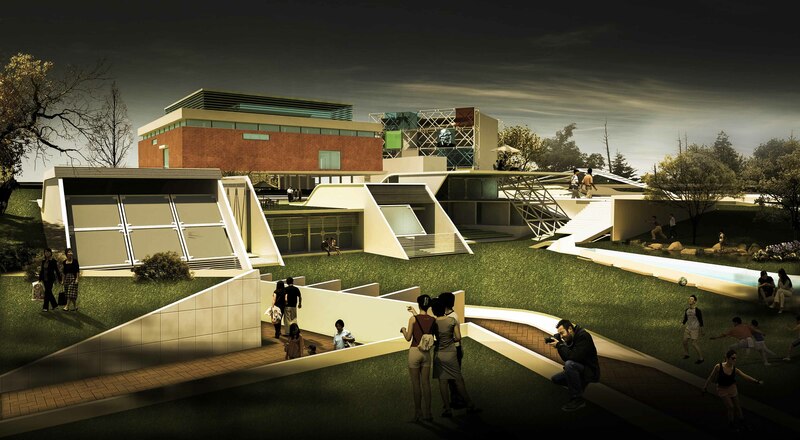 The design proposes multi-level terraces over subterranean spaces as an interactive interface between building and open space. Cafeteria and recreational areas are sited along the open avenue for the people to sit and enjoy the activities being performed in the open space. 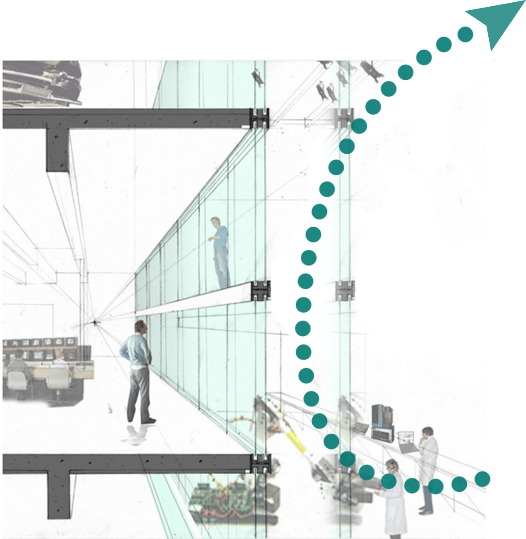 The illuminated gallery above the museum building provides a new envelope, a new interface between outer environments and Campus this will establish a visual relation with the people. The intervention will enhance the overall appearance of building and increase the foot flow into the campus, which is indeed a need of the campus for revitalization. The built form, exemplifying the understandings of environmental sustainability is an effort in maintaining the ecological balance and harmonizing with nature in the hot, dry climate of Ahmedabad. 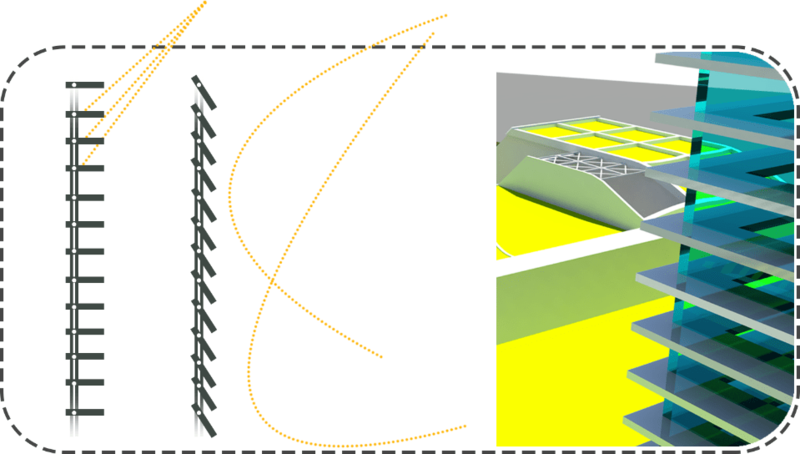 Orientation to regulate breeze and reduce solar gain are responses to the macro-climatic conditions of the site. Controlled fenestration towards south and west with large opening towards SE to control convective heat loss and optimize daylighting. 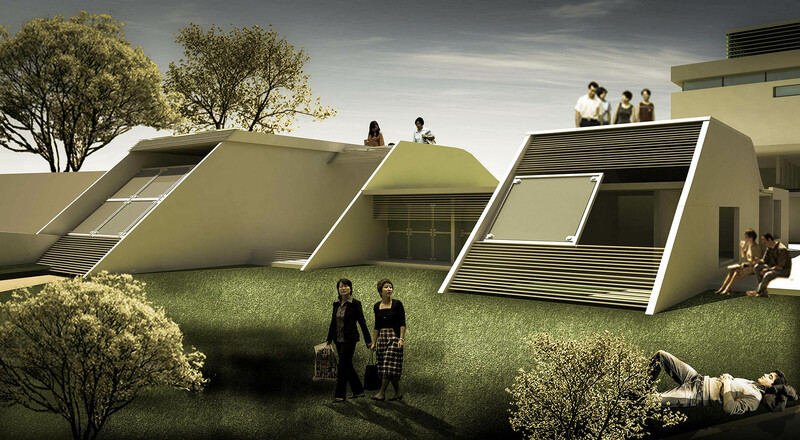 Subterranean built form has earth insulation and also prevents direct exposure from sun. Double glazed systems are installed in Facades to harness solar energy and are dynamically controlled with louvers. In terms of managing available resources of land, the built mass and landscape design facilitates and fosters microclimate control. Site terrain and assets are utilized to create subterranean spaces with optimized cut and fill. Shady trees and water bodies are provided in direction of wind, to reduce ambient temperature of the campus. The major rain water runoff is collected by water bodies provided on low lying areas of the site. 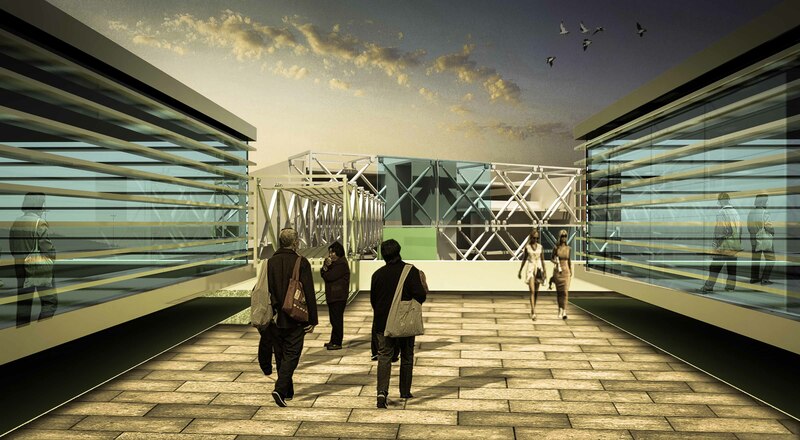 Solar photovoltaic and heating panels are envisaged to supply the intrinsic energy demand of the campus. 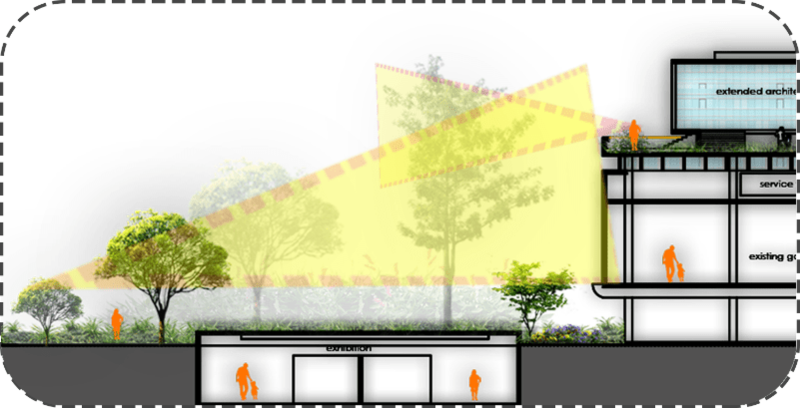 Landscape of the project is conceived with maximum retention of existing trees. A slightly sub graded sculpture garden is created to connect the Museum complex and the Tagore Hall. The garden is depressed inside the ground to craft a mystical enclosure within itself and such that it does not compete visually with the surrounding. 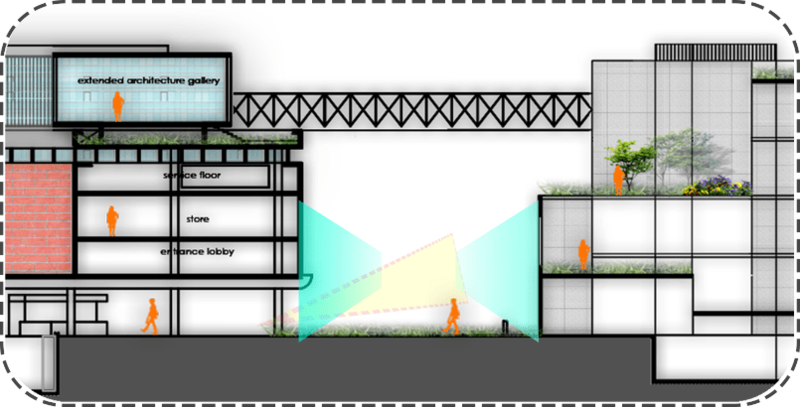 Roof garden has been provided above the museum to compensate for the lack of the same on the ground and in lieu with the Corbusier philosophy of roof as a social element. Water body is added at the side exits of the Tagore hall inspired by the same philosophy of Le Corbusier’s courtyard pool in the museum. The flow is also symbolic of the orientation of the site towards the river as conceived by the great master for the museum building. The pool and its edges also act as congregation spaces where people can sit, relax and socialize. Vast open spaces have been left in the site for functions and activities congregational in nature. 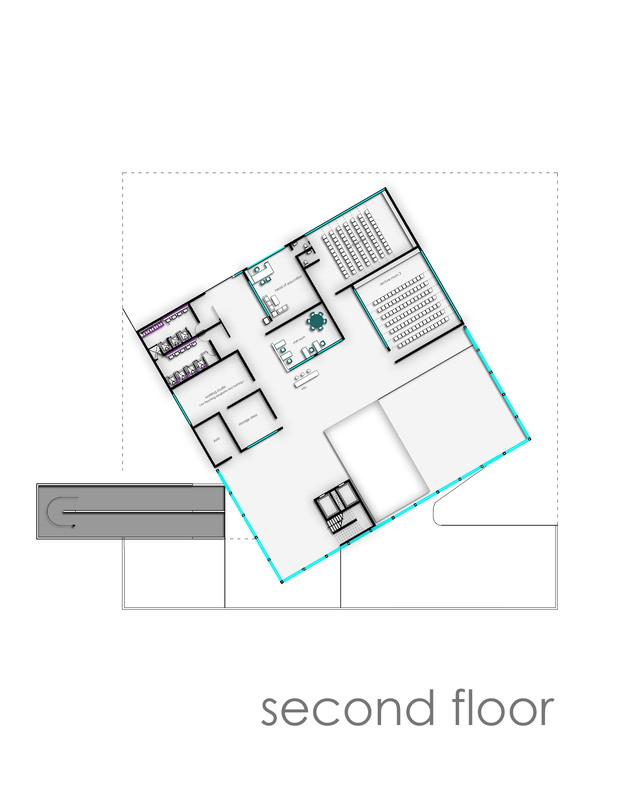 It corresponds to the Corbusean philosophy of minimalistic ground coverage and maximizing open spaces. Mounds and levels have been created to exemplify the built-unbuilt within the site. Functional dynamism and metamorphosis of space with time is used as an underlying principle of space optimization and utilization. 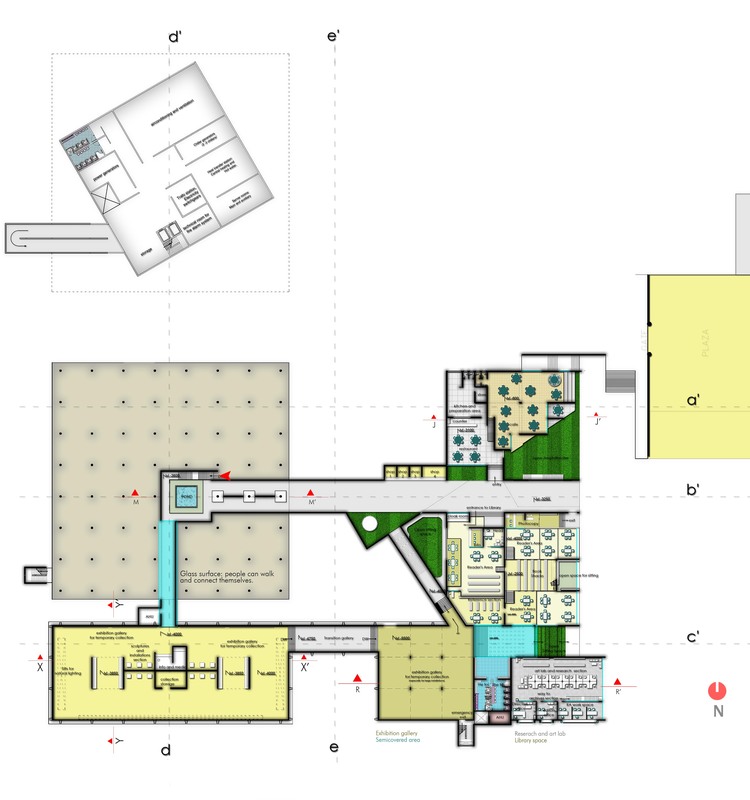 The campus is designed to accommodate the changes of usage of proposed spaces over time. The grounds upon which the project rests, lies in the revitalization of existing cultural complex and re-interpretation of the long lost but still soulfully fundamental design principles of Le-Corbusier – his design ideals and the way in which he used to impart the various deep impacts of his designs into his spaces. The project may initiate global discussion on revitalizing modern heritage structures. It’s an under-utilized asset in need of urgent attention. The city will get a new cultural landmark and interactive urban space. Sanskar Kendra is a resource to the city and this revitalization will ensure its utilization in the manner fitting to its significance.